A group of USNA volunteers has donated a freestanding mini library to a North Nashville nonprofit. 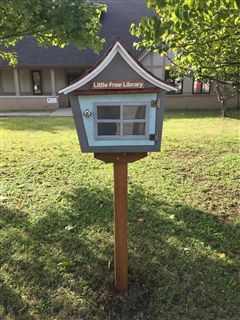 Last fall, USN parent Jake Block designed and built the Little Library to be an eye-catching item for the 2017 Fall Book Frenzy silent auction, coordinated by co-chairs Christie Laird and Melanie Block. 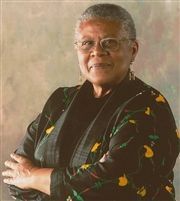 Both auction and used book sale were to benefit the school’s Hassenfeld Library. 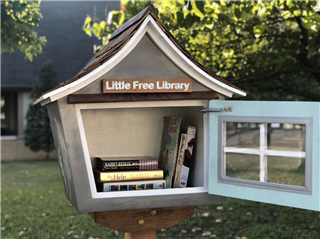 Fellow USN parents Josephine VanDevender, Giles Ward, Cyndee Ragan, and Jerry Martin purchased the Little Library with the intent of sharing it with the Nashville community. “After exploring a couple of previous donation options, we are thrilled that the Little Library is planted at St. Luke's Community House where it can fulfill its purpose of making books available to the community,” Melanie said. St. Luke's, which is dedicated to connecting children, families, and seniors with needed resources, also has a standing invitation to shop the Fall Book Frenzy to acquire new books for free to re-stock the Little Library, she added. Proceeds from the Fall Book Frenzy have been used to grow the Hassenfeld Library collection, build additional study rooms, bring authors to campus, and add a hydration station. 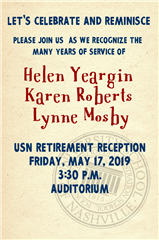 Hundreds of books also are donated to librarians, teachers, and media specialists from 10 Metro Nashville Public Schools and six local nonprofit organizations as well as Goodwill Industries of Middle Tennessee. USN parent Jake Block built the Little Library now at St. Luke's Community House.